Von Willebrand disease is part of the bleeding disorder. Von Willebrand disease is characterized by autosomal dominant disease with lacking of the the von Willebrand factor. Deficiency in the Von Willebrand factor may lead to impairment of the platelet adhesion during vascular injury to the subendothelium. This will finally lead to deficiency in the formation of the platelet plug. The intrinsic pathway of coagulation is also affected with von Willebrand disease. This is based on the fact that von Willebrand factor deficiency will lead to deficiency of the factor VIII as von Willebrand factor act as carrier protein for factor VIII. 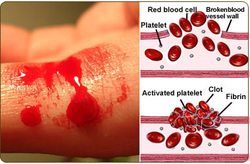 It is the common hereditary bleeding disorder and the patient typically present with mucosal bleeding with prolongation of the bleeding time , prolongation of the partial thormboplastin time, normal thrombin time and normal prothrombin time. Patient is treated with desmopressin and factor VIII replacement and patient should stay away from aspirin or other form of anticoagulant such as heparin and warfarin. 1.Robertson, Jeremy, David Lillicrap, and Paula D. James. “Von Willebrand Disease.” Pediatric Clinics of North America 55, no. 2 (April 2008): 377–392. doi:10.1016/j.pcl.2008.01.008. 2.Zimmerman, Theodore S., and Zaverio M. Ruggeri. “Von Willebrand Disease.” Human Pathology 18, no. 2 (February 1987): 140–152. doi:10.1016/S0046-8177(87)80332-5.